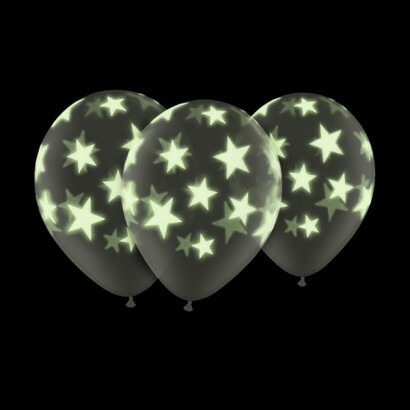 A pack of five glow in the dark balloons which are fantastic for parties and celebrations. Clear latex features glow in the dark stars to make a spectacular party balloon that's designed for use with helium or air. These glow in the dark balloons are 100% natural latex which is biodegradable and will decompose quickly. Glow in the dark star balloons feature glow crystals that absorb and store the energy from natural or artificial light. After exposure, the crystals release the absorbed energy as visible light,or glow in the dark. The glow crystals are best activated by contact with UV rays such as black light, fluorescent lighting and natural sunlight although the strength of the visibility will depend upon key variables such as the type of light used, the intensity of light, the distance of the light source from the balloon and the amount of ambient light in the room. The glow will appear stronger in a dark room once your eyes have adjusted to the lack of light; the strength of the glow is also proportional to the amount of ambient light in the room, the less ambient light, the stronger the glow will appear. To achieve the best glow, expose the balloons to the brightest UV light source that you have. Direct sunlight works better than artificial light. A UV blacklight source will keep the glow star balloons charged at all times and will achieve the brightest possible glow in a darkened room with minimal ambient light. Glow star balloons can be charged again and again for glow in the dark effects. Like the UV balloons all but 2 balloons burst when we tried to inflate them with helium. The 2 survivors did have a nice glow but all in all somewhat underwhelmed by their performance. The Glow Company Says: Thanks for the feedback, we haven't come across this problem with these balloons before, but as you say, it sounds as though they are best used without helium unless they can be measured to ensure that they're inflated to no more than 11". Thanks for bringing this to our attention. Blowing up the balloons seems to stretch the luminous material a little thin so they are a bit dim, but charging them up with a strong UV source works pretty well for a while. These balloons were easy to inflate and none burst. They glowed well in the dark and the kids loved them. A week later they are still as effective and have not gone down or wrinkly. Great fun for Halloween! Fantastic product, they looked amazing, great customer service, thank you!